What would it be like if smarter communication were possible with your customers? If also your contact center agents, attendant and other employees who intensively communicate with customer would be able to work with Skype for Business? What if customer care calls, emails and chats would directly be routed to the right person? With unrivalled speed and accuracy? What would it be like if your organization could achieve growth due to real time and historic reporting on all call flows? Not limited by departments, company buildings or even country boundaries. What if advanced customer contact care features were available through one simple online tool? From this customer perspective, CC4Skype was developed. 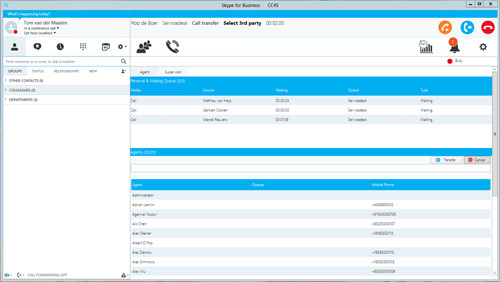 Advanced call management features, fully integrated with Skype for Business. Offer your employees with customer care responsibilities the opportunity to participate in ACD groups, call transfer and call recording. Offer your supervisors a complete dashboard and direct link with their people with historical- and real time reporting. 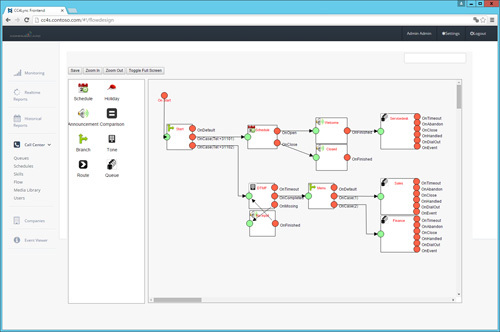 Have your administrator experience the graphical IVR to easily and quickly build call flows. By this means, customer interaction is the first time right smoothly routed to the right person. Easily deployed for 2 to 10.000 seats, on premise or as a cloud service.